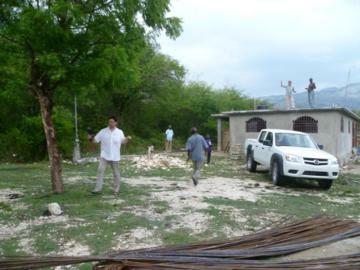 March 2012, a GHA team went on the spot. 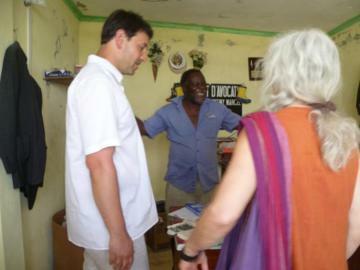 They went directly from the airport to Mirebalais (Marouge). 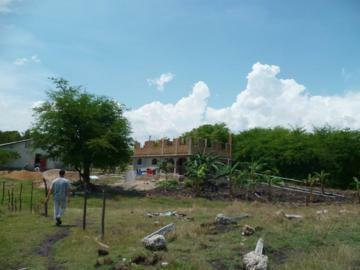 The house was finished a few months ago and now there is an intense activity at this place (school, music…). 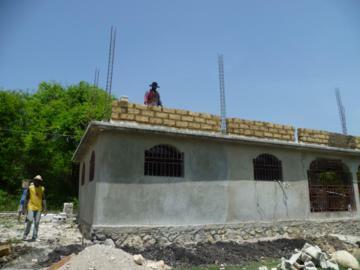 The building work has been done properly, the sewage and water systems are working fine and there is electricity. 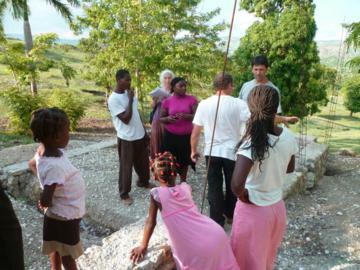 Next morning the team visits the Fejat-Marouge school , which is using the premises of the church that was built two years ago. 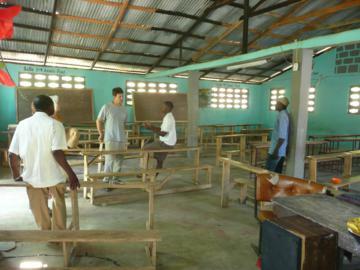 Two teachers share the building for 2 classes : one for the high grade nursery school and one for the other classes. Classes are taught every day from 9 AM to 13 PM, except on Saturdays and Sundays. 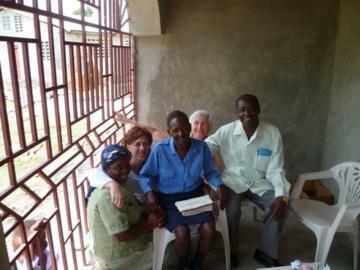 Twice a week there is an adult literacy class in the afternoon. At the end of the day, choirs come there to rehearse. 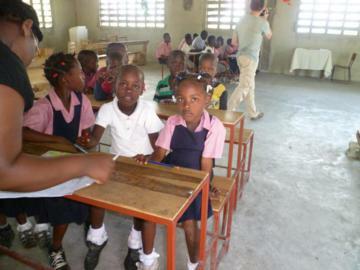 As far as the Domont classes are concerned, things are not working as good : the premises that were used as classrooms have been recovered by their owner, so now the classes are taught outside under cover of canvas sheets and without tables ; but the schooling goes on. 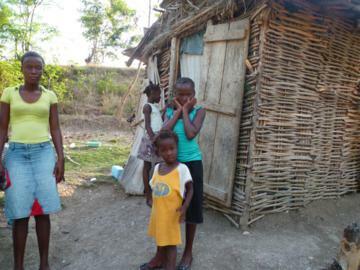 Some actions have been taken to try to buy a piece of land on which we could build a school. Without a fixed space it is not realistic to get school material. We talk here about sixty children. One of the biggest problems we meet in the classes at Marouge and Domont is about food. 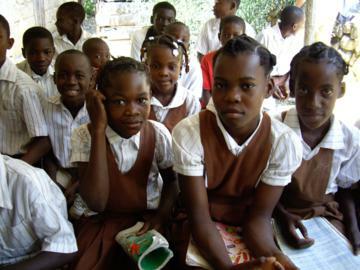 Many children come to the class with an empty belly and they have therefore difficulties in concentrating. 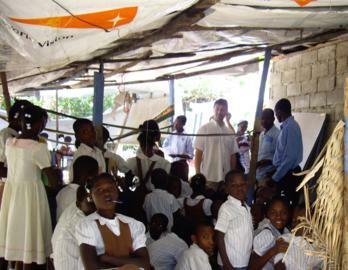 For that reason we are putting up a project for food for school children related to the agriculture school (see below). 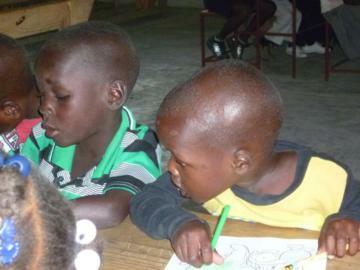 The idea is to give the children a light meal (a cereal and a legume) as soon as they arrive at the school. To achieve that, we are including an hour of work in the mission’s vegetable garden in order to grow the food for these meals and also to encourage them to grow at home. 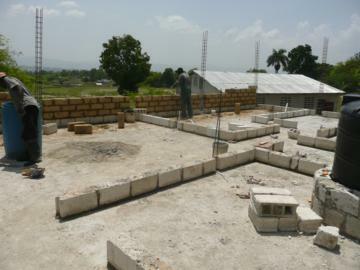 In Marouge, the building of the orphanage is ready to start. 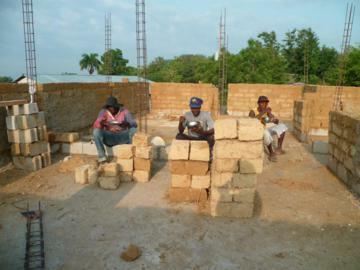 Before the teams got here, the haitian craftsmen whom have learnt how to build with adobe have made all the blocks necessary for the construction. 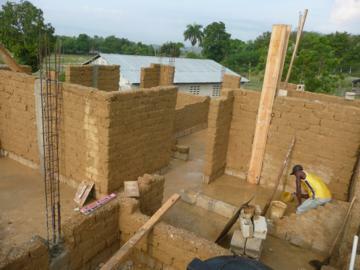 The construction work starts very quickly. 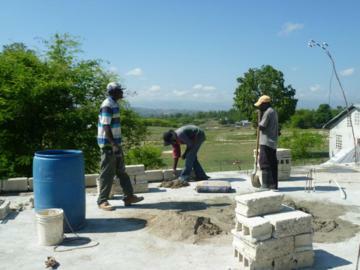 The base is made of concrete blocks as required. 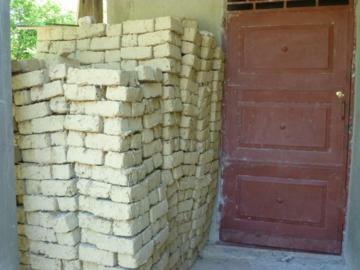 And soon adobe bricks pile. 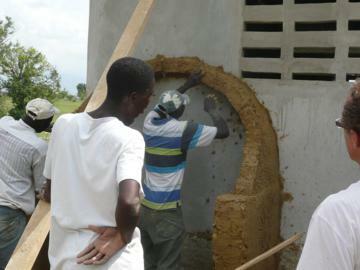 For educational purpose, the team’s craftsman asks them to wait a little before they apply the lime coating. It’s the rain season and it rains every day. And despite the rain the adobe walls are withstanding allright and the fear left from the former bad experiences disappears. The poles are set up according to the parasismic norms. The roof will be made in a hurricane-proof sheet steel and it will be used to supply a new tank – adding to the former of 95 m3 – with water. Water is a precious commodity there, as it’s raining less and less often but stronger and stronger. One of the great advantages of the central plateau in Haïti is that there is a lot of clay ; You just have to bend down to pic kit up. 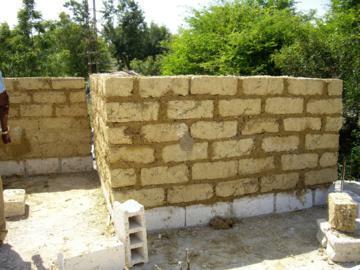 A housing project for very poor families has started. 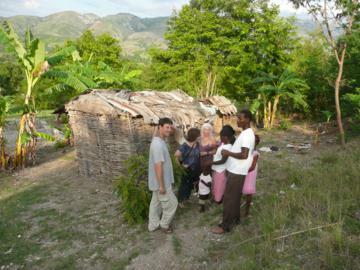 The whole family lives in this small hut. 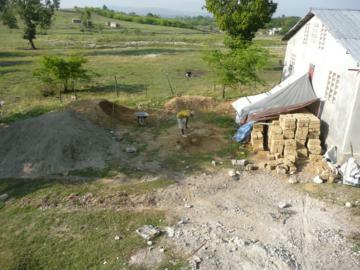 making the adobe bricks put them up. 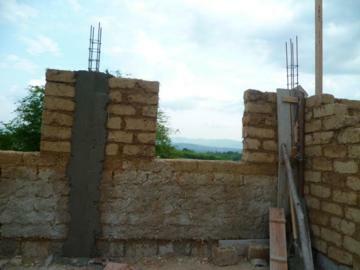 The organization will provide the technical assistance with the help of one of the craftsmen who built the house and the orphanage, and he will supply him with the hurricane-proof steel sheet for the roof. Another family of 10 will get the same help. 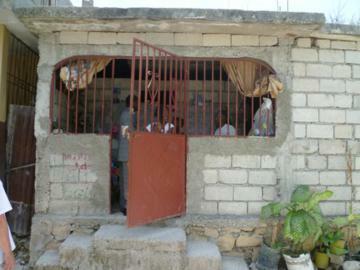 In Port au Prince the team visited the orphanage which had been helped. 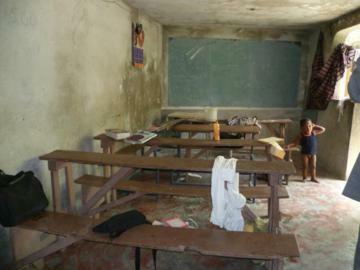 About 20 children live here and get literacy teaching as well. 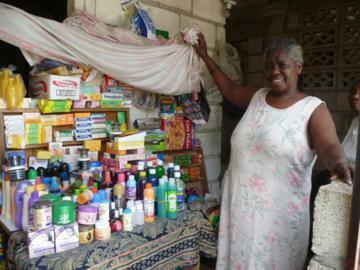 The organization has helped with the most urgent needs (food). 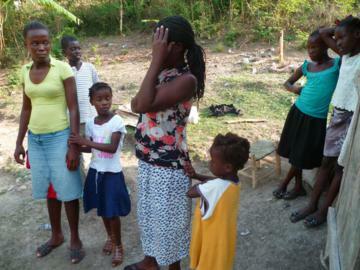 One family which had got help after the earthquake received a visit as well in Port au Prince. 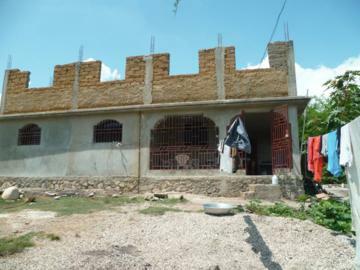 The house has been rebuilt and the mother is running a little business that enables her to provide for the family’s basic needs. 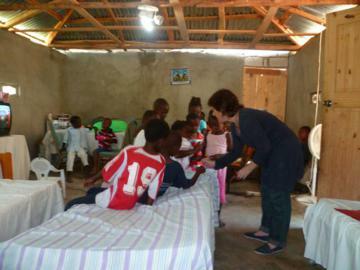 Another orphanage on the central plateau in Peligre has received help as well. 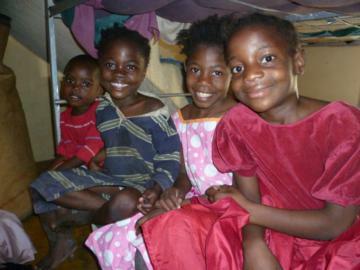 The help was given to buy a cooker, beds for the children and rice. 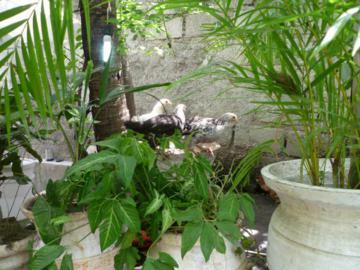 In the future there is a project for a garden big enough to feed the orphanage. 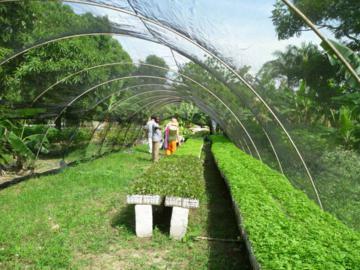 In the meantime, things are going forward in Marouge. .
A class in agriculture has been opened together with the creation of a vegetable garden. 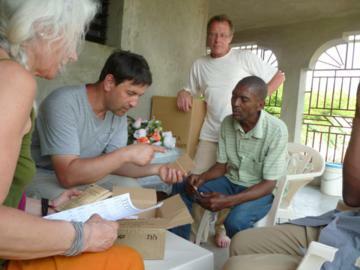 An agronomist is asked to set up the plantations and to instruct the persons interested in this work. 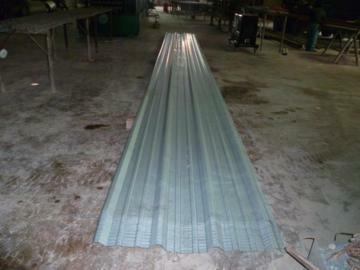 Given the rainfalls, a hot house is needed to make the sowing. 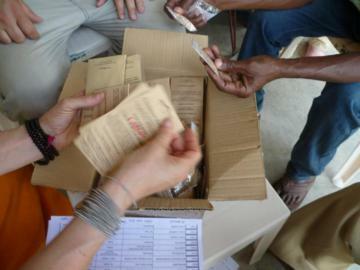 The seeds are provided by the Kokopelli organization. The idea is to grow as many plants as possible to be able to reallocate the seeds freely to all the people who wish to plant. All the varieties are fertile. 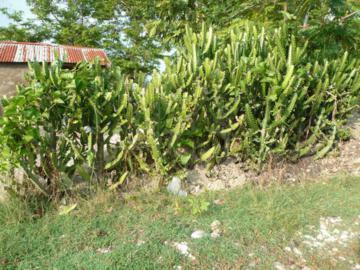 For the vegetable garden, a fence is needed. 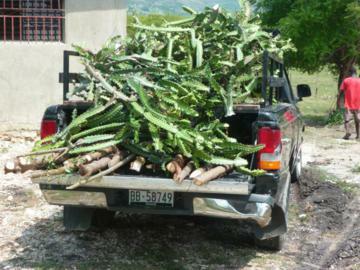 It will be made of branches and of a cactus called chandelier. 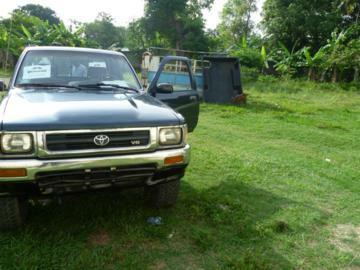 A used pick-up has been bought for the transportation of the mission’s priest and of goods between Port au Prince and Mirabelais and for the needs of the orphanage. Mechanics from the community will do the maintenance. 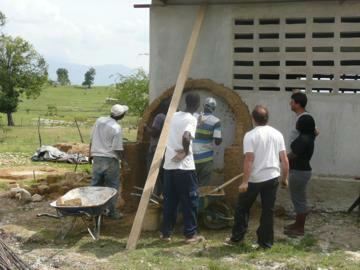 And before the team’s departure, the craftsman made a course in clay building based on the Nubian Vault.